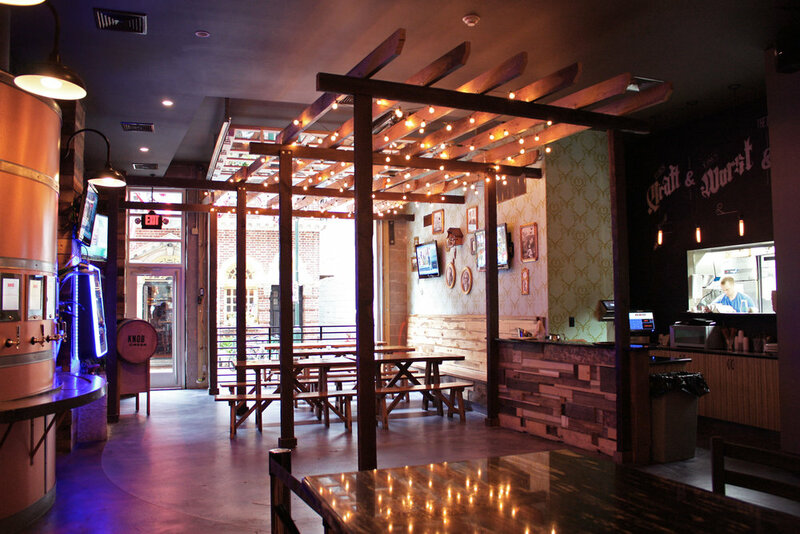 BRU Craft & Wurst is located in the Midtown Village district of Philadelphia, Pennsylvania. The design concept for the restaurant/bar is a modern, urban, minimalist style "indoor" German beer garden. The space contains engaging and dynamic custom design elements that create a truly unique bar & dining experience. The material palette of the space is honest and rustic. The main materials are Old Philadelphia brick and reclaimed wood, sourced locally from Lancaster County, Pennsylvania. A series of concrete planters strategically placed throughout the space contrasts and softens the brick & wood elements with inviting and lively green areas. The anchoring element of the space is a 50-foot-long 3D wood wall, composed of a variety wood species, sizes, and stain colors. The wood wall is a visual element that connects the front and rear spaces on each side of the centrally located bar area. The language of the wood wall is also repeated below the bar counter. The back of the space opens out to a small urban alley with a 12 ft x 12 ft aluminum & glass garage door, creating the desired outdoor vibe. There is also a custom designed self-service beer tap station, where patrons can purchase and pour their spirit of choice. The light fixture selections and exposed duct work tie all of the design elements together, adding an urban/industrial twist to the traditional beer garden concept.